There are many products (such as cosmetics, food, etc.) in our daily life made of emulsions, mixtures of water and oil. However, water and oil are essentially immiscible, and both liquids tend to separate into two phases. Interfacial tension is the force acting between two different liquids. Higher interfacial tension means that both liquids tend to separate into two phases. The higher the interfacial tension value, the more likely the phase separation of the two liquids occurs. Thus, decreasing the interfacial tension is essential to create a stable emulsion. As such, the interfacial tension is an indicator for better understanding stable emulsion formation. Two kinds of measurement methods, the Wilhelmy and pendant drop, are usually used for evaluating interfacial tension. The Wilhelmy method using a platinum plate is a method utilizing the drawing force of liquid to the plate, and this force is converted into interfacial tension. The pendant drop method is a method of applying the curvature radius of the liquid and is often used by many researchers in recent years. 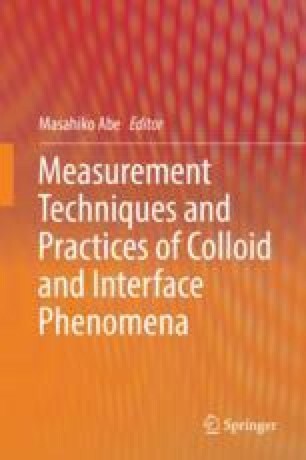 The principle and detailed information of evaluating interfacial tension is described in this chapter.